First, Jen at My Nail Polish Obsession and I decided we would start something fun with all the polishes that we both own. This is our first installment of our twin day, which we both posted to our blogs and Instagram. Find Jen on Instagram here. The polish is a gorgeous mauve-pink type color (you can see it was impossible to photograph) with a slight shimmer and blue and green glitter. I used ONE coat of this polish, which is pretty amazing. I noticed when I got the polish, all the glitter had completely sunken. I chalked it up to the shipping, as that happens. I shook and shook and could not get it off the bottom. I put it upside down for 2 days and finally some results. Then, I had it standing up the correct way and 2 days later, the entire bottle was completely separated. 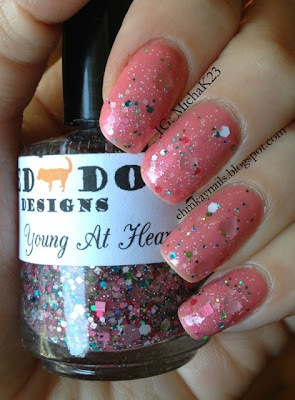 All shimmer and glitter on the bottom, plain pink pigment, and a curious milky layer (about one inch) on the top. 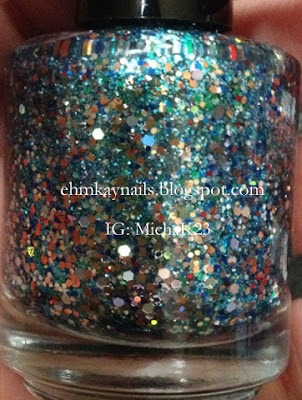 Maybe because this polish is super pigmented (hence one coat) or maybe the base is being cut, that it cannot support the pigment. All I know is separation should not be that fast. In order to wear this polish, I needed to turn the bottle upside for another 2 days and still, the shimmer never mixed in correctly. I alerted the maker of this polish, and she offered a refund and to make it right, which I declined. The thing is, the polish can still be used and IS still pretty, you just need to prep it. It's so awesome to find a polish that only needs one coat. I literally finished my nails in 8 minutes (with base and top coat). 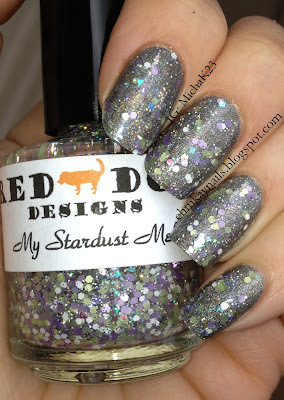 Today I have a simple NOTD (Nail of the Day) with one of my favorite indies, Red Dog Designs. Every polish of hers is no short of stunning. I'm slowly buying all of her colors. 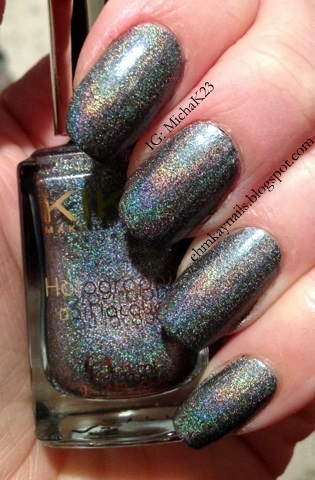 I started with Kiko Holographic 400 (Grey), which went on with an easy two coats. 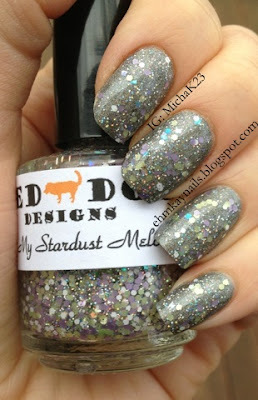 Then I added one coat of My Stardust Melody. This polish is crazy sparkly in person and the iridescent squares add so much depth. I only had clouds when I wore this, but you can imagine how crazy beautiful it would be in the sun since it looks this good in clouds. 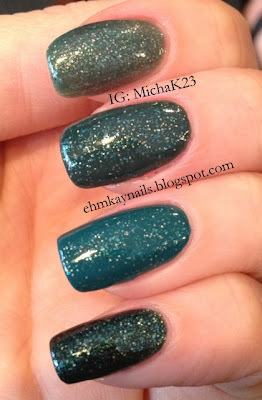 Quite a few bloggers have swatched this over many different colors and it always looks awesome. 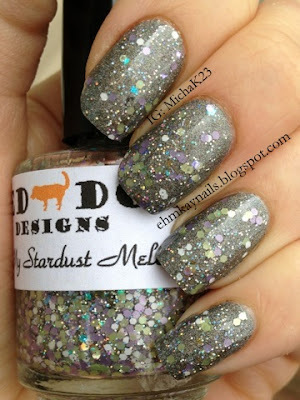 My Stardust Melody looks good over ANYTHING, so it's very versatile. 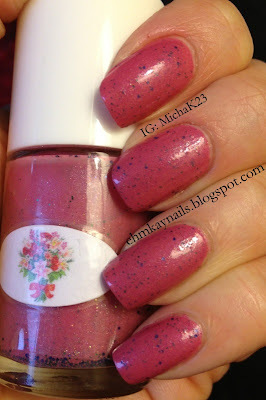 Today I have some polishes sent for review from Bubbles N Balms. Renee, the creator, does soaps, lotions, scrubs, as well as polishes. I even got a sample of her sugar scrub and I have to say, it was amazing. I used about a teaspoon of the scrub with warm water and my hands were so smooth and refreshed. I highly suggest you check out her shop (link at the bottom). On to the polish, all are shown without base and top coat. 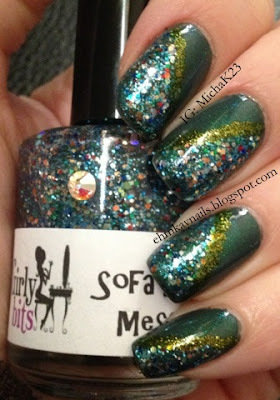 Emerald Bay: Renee says this is "A blend of opalescent and green micro glitter suspended in in a deep emerald green jelly. 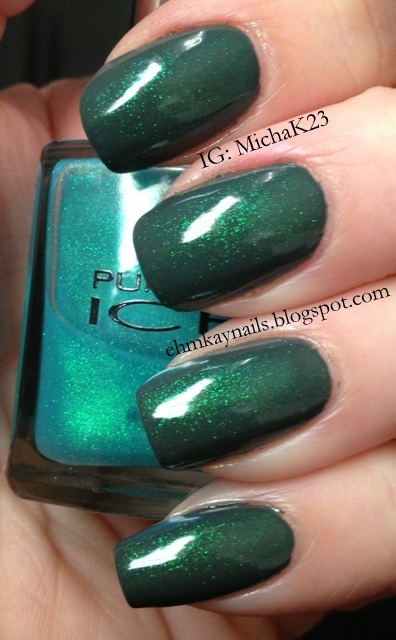 Opaque in 2-3 coats." 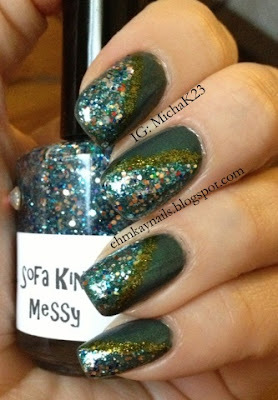 I much prefer this polish layered verse alone. You can see why in the swatches. My nails are fairly long, so I needed three coats. On all the other nails, I used one coat of Emerald Bay. I think the combo of Emerald Bay and Illamasqua Muse were made for each other. 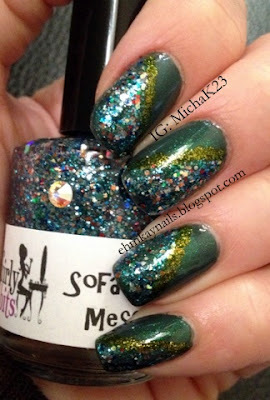 This is the perfect St. Patrick's Day polish for someone who wants glitter, but something that isn't so in your face. Galaxy: This glitter combination is mostly blue and "is packed with different shapes, shades and sizes of holo and matte blue glitter and a titch of iridescence." 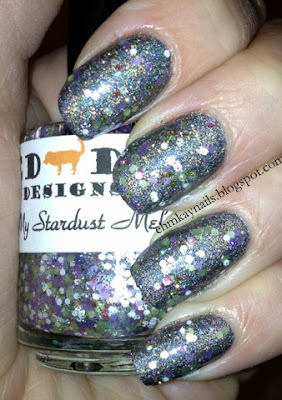 While not normally a matte glitter fan, I think the blue matte hexes give a great balance to the holographic glitter in this one. Party Pants: This glitter is a "a sheer purple & black glitter polish" with iridescent glitters. This is the one I probably should have done two coats of. I recently put this over Illamasqua Baptiste on my sister and it looked amazing. 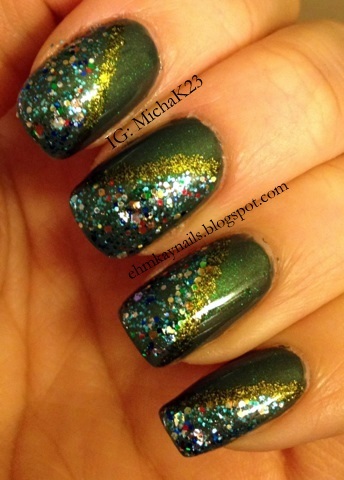 All of the glitters went on smoothly with one coat. Some I probably should have done two coats because of the mini bottle, but I feel like if you order full size bottles, one coat is all you need. Application was great--the glitters were neither too thick or too thin. 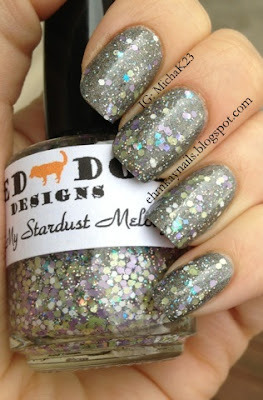 None of the glitters were curled and felt relatively smooth without any top coat. 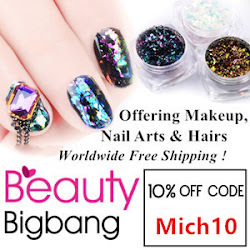 You can find Bubbles N Balms polishes and beauty products at her Etsy shop here. 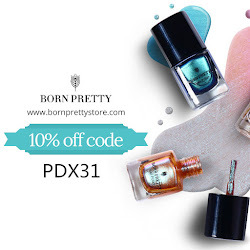 Here polishes range from $4.25 for minis to $8.25 for full size polishes. She even has some on sale right now. All of her beauty products are also reasonable priced so check it out. Ahhh sorry for my mini hiatus. It was my spring break (I am a teacher) and I basically went off line for the week. But I'm back with some easy nail art that I did! I had all these big ideas, but instead, I had completely naked nails for five days and then threw this together quickly. 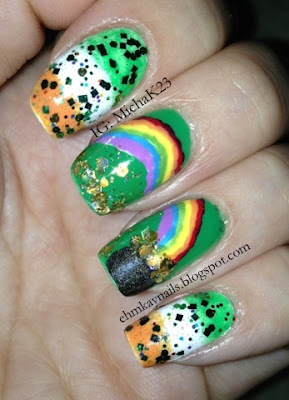 For my right hand and my index and pink on my left hand, I did a loose gradient of Ireland's flag colors. 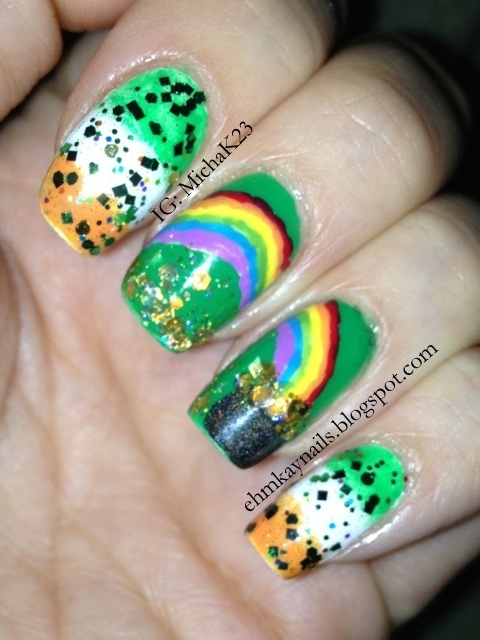 Then I topped it off with Red Dog Designs Lucky Charms. 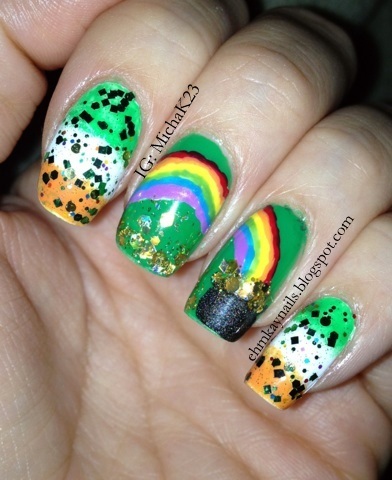 Lucky Charms is an awesome green glitter with a variety of shapes and gold coins. 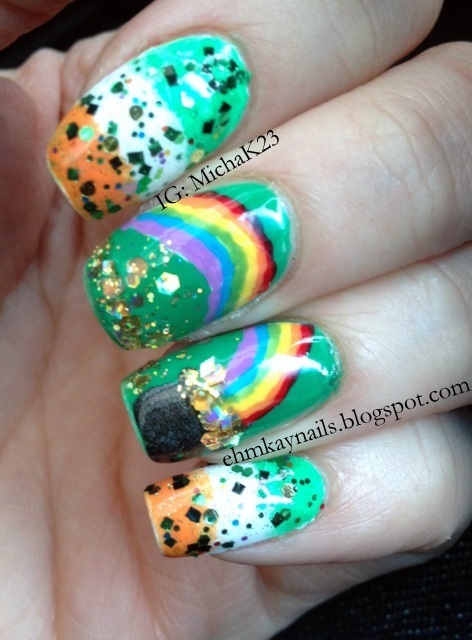 It also has smaller rainbow glitter. It was the perfect compliment to my flag nails. I used a basic white cream along with Zoya Arizona and Barry M Spring Green for the flags. The green on my middle and ring finger is also Barry M Spring green. 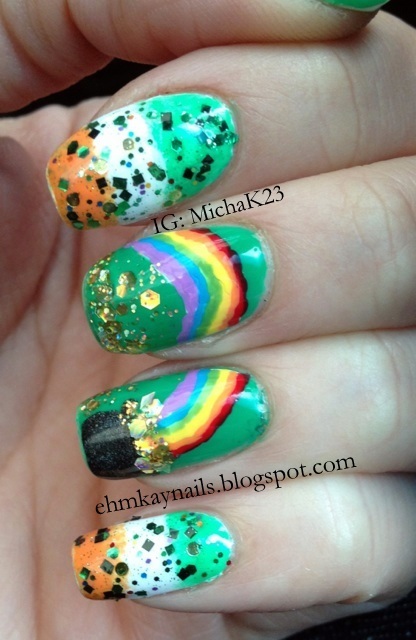 For the center, I did a pot of gold and a rainbow. Easy and simple. 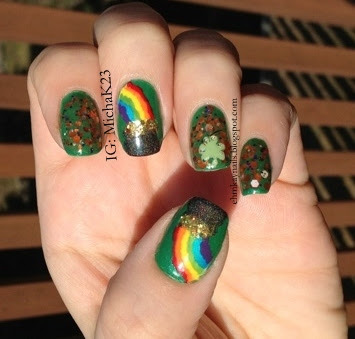 I also posted last year's pot of gold St. Patrick's Day mani. 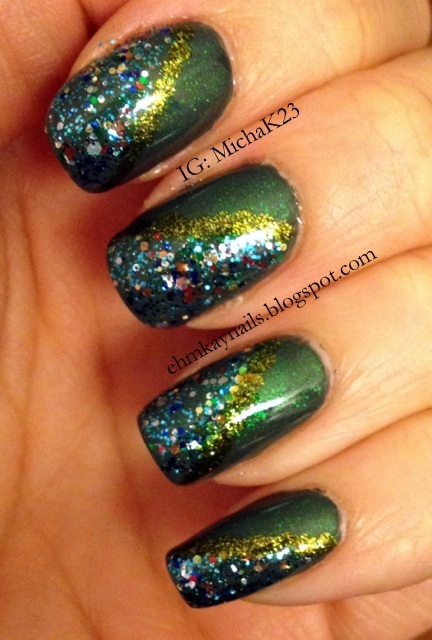 A quickie NOTD that I'm sure you've seen a million times. I bought this for myself as a gift when I had a successful midterm review. It is actually still available at retail price on Dior.com, so don't fall for the eBay prices. 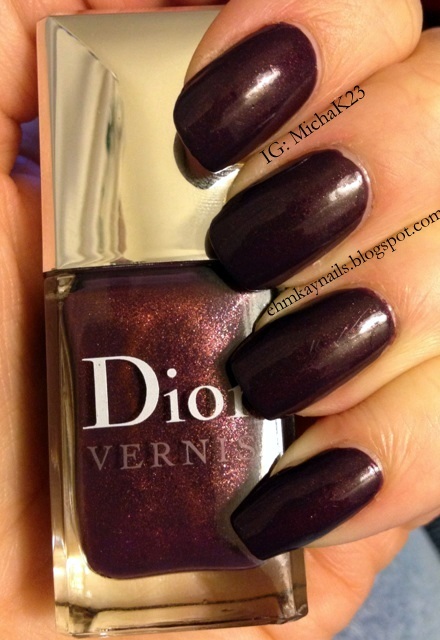 Shadow is a deep purple with a pink shimmer throughout. I actually don't think I look that great in dark colors, but I didn't feel right topping this with glitter as it was just too pretty. Two easy coats. At first, using the Dior brush made me feel like I didn't know how to paint my nails. But after the first coat, I was in love with the wide brush! 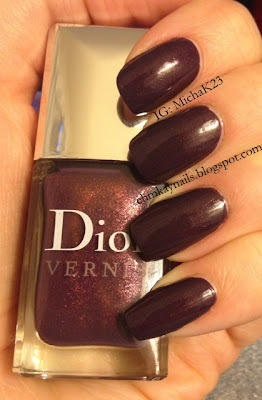 I know Diors are pricey, but this polish lasted for days and I was not kind to my hands. I don't wear gloves when I do the dishes or clean and I cook every night. When I go on vacation, I know I will be reaching for my Diors since the quality is just so great. 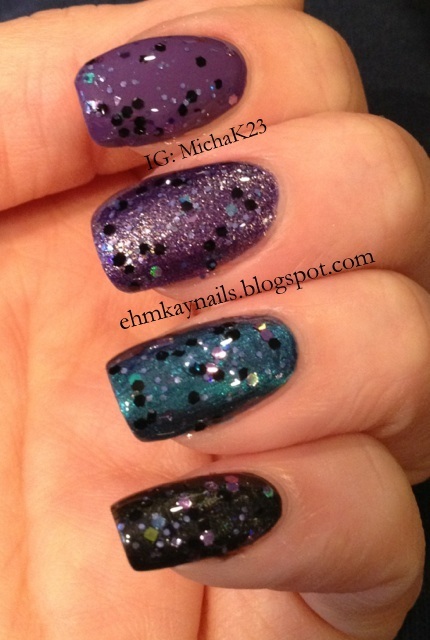 I took pictures in a ton of different lighting to show off the shimmer and how sometimes Shadow is a brighter purple. What do you think of dark colors? I'm not so sure I can pull them off, but I still wear them! 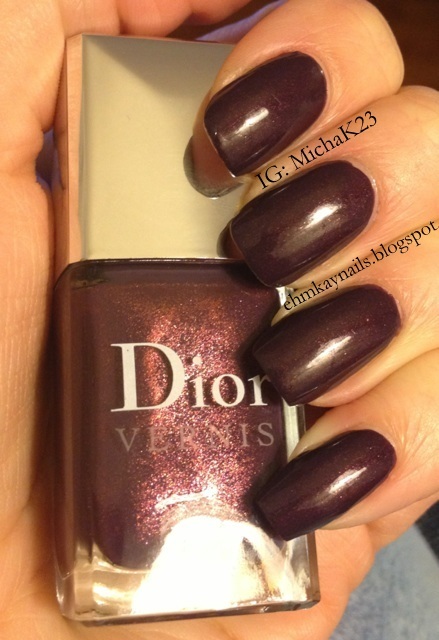 I'm really in love with this manicure. It's a mix of indies, salon, and drug store brands. I don't discriminate with my polish and I love 99 cent polish up to the Chanels and Diors. This started with 2 coats of Zoya Evvie, which I got with the original Peter Som set from a giveaway from Pointless Cafe. 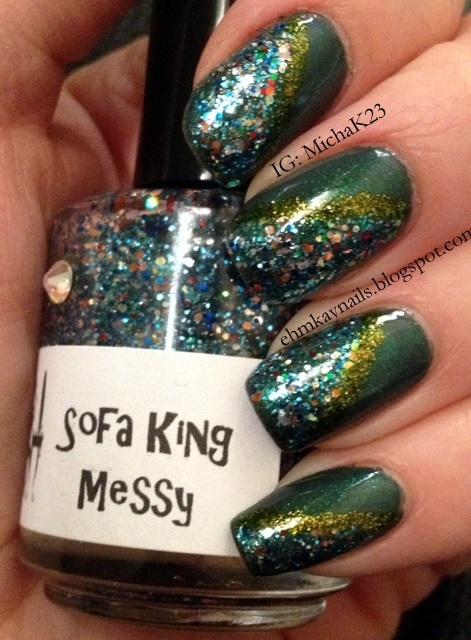 It is a creamy, beautiful dusty green that dried super glossy. Then I added one coat of Pure Ice Heartbreaker. I use Heartbreaker all of the time and it is one of my polishes with the biggest dent in it. It's perfect for layering and you can see the blue and green shifts that it creates over Evvie. For $2, this is seriously a steal. Then I added a diagonal with Girly Bits Sofa King Messy. Say that out loud really fast. 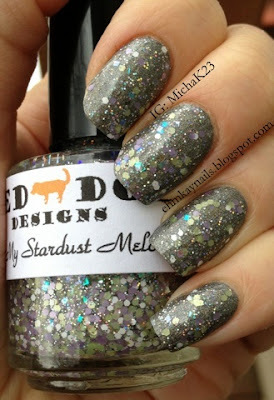 Pam at Girly Bits had a little mess with glitter and she picked up any useable glitter and made this polish. Not sure if it will ever be sold, but I love the mistake combination! Lastly, I added a line of dots with Orly It's Not Rocket Science. 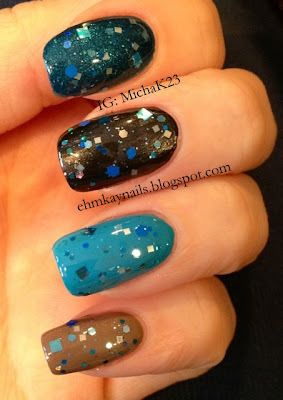 I love the different types of textures of this manicure and that's what I love about nail polish in general. Like when cooking, if you have something soft, you want to balance it with something crunchy. Same goes with polish. I took lots of different pictures to show off the shimmer and glitter. Some are a bit blurry but they should the shimmer the best. I love to layer. It's my favorite thing about nail polish. I take a plain color and make it my own. Have any fun combos lately? Let me know! 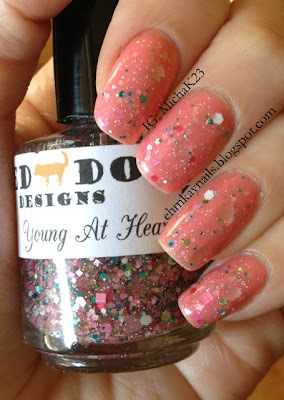 Red Dog Designs Young at Heart with a Dior Lemming Squashed! FIRST UP: I hit over 200 likes last night on Facebook and crossing my fingers for 150 GFC followers because I have an awesome giveaway for you! 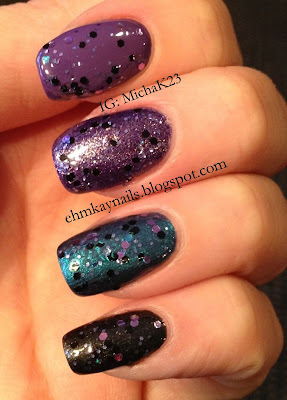 It's a collection of polishes not even released yet, so hopefully I can have the giveaway next week! Thank you all for the support! I realize Valentine's Day was two weeks ago, but this is what I wore! If you aren't folliwng me on Instagram already, be sure you do as I posted the mani on Vday. 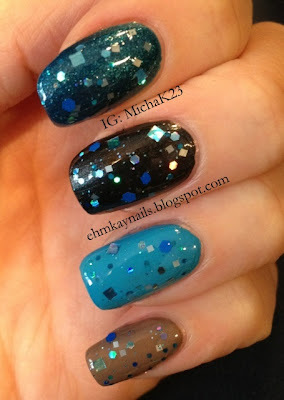 A few months ago, my polish friend Jen from My Nail Polish Obsession (do you see a trend here? 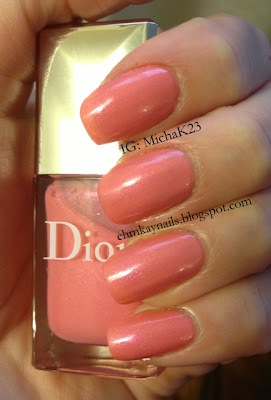 She finds so many of my lemmings) went to a Dior store and lo and behold found one of my lemmings, Flapper Pink/Rose Vamp! 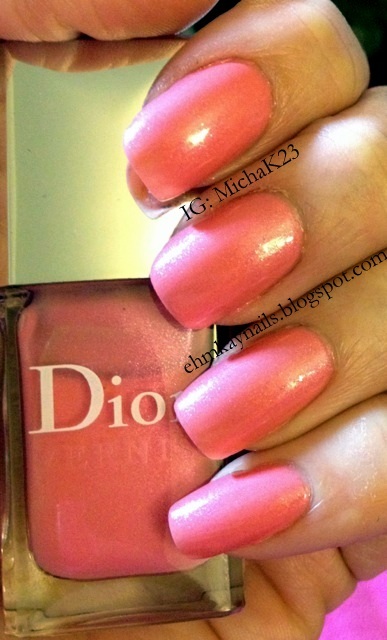 It is a super shimmer pink that is so delicate but so beautiful. 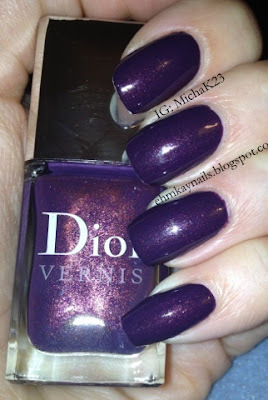 Unlike other Diors, the shimmer is very present. A little sheer, I did three coats and it was just so beautiful. The pink was really hard to capture because it looks so different in different lights but I think I've got every angle represented. 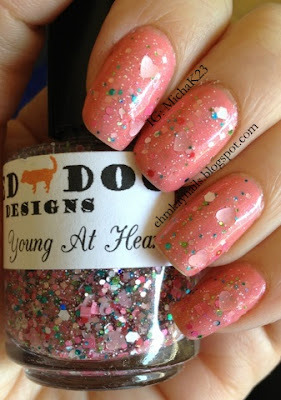 I knew I wanted to pair it with one of my new Red Dog Designs, Young at Heart. It was very matchy so the hearts blend into Flapper Pink, but I actually preferred it that way. 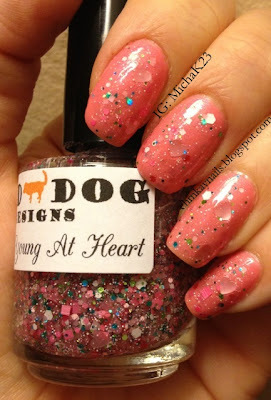 No digging for hearts and there was an even dispersal of glitter with just one coat. The boyfriend said it reminded him of Strawberry Frosted Donuts and he is totally right! 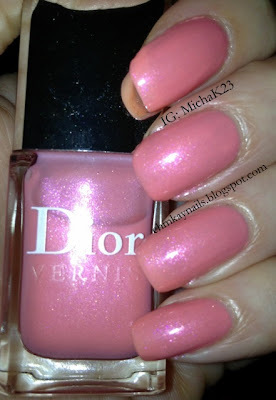 Did you rock pink on Valentine's Day or did you go non-traditional?